Weekend America: What Makes a Great War Movie? What Makes a Great War Movie? George C. Scott in "Patton"
Watch the film trailer for "The Longest Day"
Larry Suid: The same thing that makes a good movie of any genre -- it tells the story with a beginning, middle and end and has characters with whom you can empathize. The difference in a war movie is the violence that accompanies the stories. If you go back to the "The Longest Day," which I think is the best war movie -- even though its violence had to be muted because of the code office, it still captured the confusion and the violence and the death in Normandy. Cooper: So Larry, what is "The Longest Day" about? I never saw that film. Suid: "The Longest Day" is the re-creation of D-day, June 6, 1944, by Darryl Zanuck, primarily focusing on the fighting on Omaha Beach and the bravery of the American troops that had to come off the landing craft in the face of significant German fire from the cliffs overlooking the beaches. So we have a clip from "The Longest Day." Let's listen to that. That's my favorite scene in the movie. Ironically, it's fiction. Even though it's inaccurate, it captures the essence of the day and it does not change history. The American wonders who won and that's probably part of the confusion that existed for many days. You know, one more film that stands out to me is "Patton." You've got George C. Scott in that opening scene stepping up in front of that huge American flag. Any film that is to me a great film must leave something to the culture -- whether it's visual, whether it's sound, whether it's music. 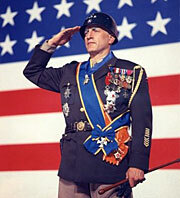 In the case of "Patton," the opening sequence, you always think of it as parodied. It is made fun of, but it truly captures the American people, that they love a winner and will not tolerate a loser. And then of course at the very end, Patton goes off in a field and there's a windmill and people immediately connect Patton with Don Quixote. And the screenwriter told me absolutely that was the intended image to leave. This great general who also made a fool of himself is a little bit like Don Quixote -- brave, but a little bit crazy. The problem with this is that this is in the middle of the Vietnam war and we are losing. So what you're saying is that "Patton" is a World War II film that was released during the Vietnam War? Right. So you have the pro-war people saying, "Where is Patton when we need him?" The anti-war people saying, "That's why we are where we are because he glorifies violence and killing and the need to win." There's a problem there. Once Vietnam became controversial, filmmakers didn't want to make movies about the war. There were no heroes, so if they wanted to make a traditional war movie with a great hero with violence with the Americans winning, they had to go back to World War II. Are there no recent movies that we feel are in the genre of classic war films? Well, I think "Black Hawk Down" -- even though it has some gratuitous violence, it's a very powerful movie. It shows the sacrifices Americans made, the losses they suffered, ultimately for no good reason. But it is a fine movie and I think it will become a classic. What is the theme in war films that has stayed constant through the years? Young, innocent boys are turned into men. And this starts way back in World War I -- "The Unbeliever." Rich boy supposedly sees Marines, he knows World War I is going to be fought and he joins. He's a dilettante. He's a non-believer, an elitist. The Marines turn him into a man, and also at the end give him a girlfriend. Larry, this has been a wonderful conversation, thank you for joining us. Hands down PATTON containing only 7 minutes of actual battle scenes, The most literate explanation of "How a war works" even made. I, too, am a fan or war movies. I think The Enemy Below (1957, 20th Century Fox) can't be beat for showing both the physical and mental horror of war. The original Star Trek had an episode that was a re-make of this plot. The Germans and the Americans were replaced by Romulians and the Federation. War is an old, sad human story that just keeps playing itself out over and over. This segment about great war movies was very entertaining and not just for fans of the genre. However, I think there are several great movies that also show an accurate portrayal of the anguish, pain and futility of war without the glamorization or romanticism. Among these are 12 O'Clock High (World War II), Pork Chop Hill (Korea) and Hamburger Hill (Vietnam). For pure satire, The Americanization of Emily has to rank among the best along with M*A*S*H. Not every war film has to be graphically violent to effectively get its point across.